Affordable open-back headphones for entry-audiophiles from Sennheiser. An entry-level audiophile option like the Sennheiser HD 559 open-back headphones offer a great mix of comfort, quality, and performance. Large ear cups and soft velour cushions offer a comfortable fit. Sennheiser’s iconic over-ear style provides dependable comfort for long-term use. The Sennheiser HD 559 ear pads are over-sized and covered in a soft velour fabric that gently rests around the entire ear. You can easily replace them if they get worn-out. Along with an open-back ear cup design, other features make these over-ear headphones very comfortable and cozy to wear. Sennheiser’s E.A.R “Ergonomic Acoustic Refinement” design helps to blend the physical and audio experience so you feel like you’re listening “in the room”. A wide and padded headband reduces any pressure points on top the head. However, these around-ear headphones can feel tight for bigger heads or when wearing them over a cap, especially when new. With time the headband clamping force will soften and become more comfortable. Quality construction and components, but not very compact. 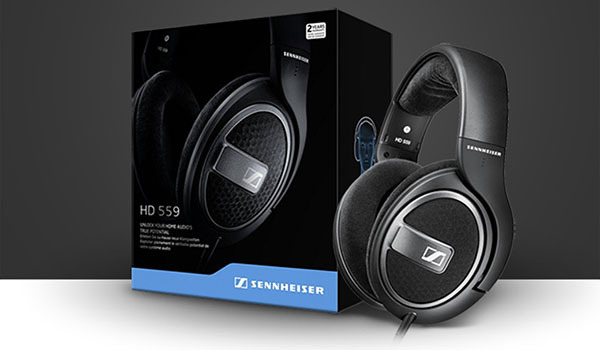 These Sennheiser HD headphones are really designed to be used in and around the home and office. While there are various storage cases available separately, these headphones don’t fold flat. That can cause strain in some commuting environments. HD 559 really were made for home use. Overall the build quality is good and there are few reports of construction flaws or damage beyond normal wear and tear. This pair of headphones is a relatively new member of the HD 500-series. This series is well known for its reliability and quality performance. Sennheiser also offers a 2-year warranty and there are replacement ear pads available if you ever need new ones. Factory detachable ¼” cable requires a separate 3.5mm adapter. A 9.8 feet (3 meters) straight detachable cable is the only thing included with the Sennheiser HD 559 headphones. This cable has a 4-segment 3.5mm connector that plugs and locks into the left ear cup. The other end of the cable features a 6.3mm/¼” stereo plug. Unfortunately, there is no 6.3mm to 3.5mm adapter included. So you’ll need to supply your own or purchase a separate cable if you need the smaller connector type. Sennheiser audio quality that won’t break the bank. The open-back HD 559 headphones deliver a number of great benefits that you’ll find in higher priced audiophile models. A wide soundstage provides an immersive listening experience. Of course, the open-back design also means that there is no sound isolation or control for noise bleed, so take that into consideration. The 38mm drivers produce a surprising amount of bass. The low-end only starts to distort and breakup a small amount at higher volume levels. Overall, bass response is still up to entry-audiophile standards and you’ll have a lot of fun with it. Highs are generally even and relaxed. Mids hold their own without competing for attention. It should be noted that some instruments can seem a bit harsh in the upper register, especially with lower quality amps or digital music files. Again, the Sennheiser HD 559 headphones can be considered an entry-level audiophile set of headphones with Hi-Fi sound quality. This means that the sound signature may not be perfectly balanced, but the performance is very good for the price. These are great headphones for using with your high definition home entertainment system or enjoying the depth and detail in your music. If you want spacious and rich sound from a set of open headphones that are super comfortable, these Sennheiser HD 559 headphones are certainly worth trying especially considering the price.